"Read 500 pages every day. That's how knowledge works. It builds up, like compound interest. All of you can do it, but I guarantee not many of you will do it." This is a quote from legendary investor Warren Buffett who devotes 80% of each day to reading, and whose 80 billion dollar fortune is built upon the foundations of what he reads in books. 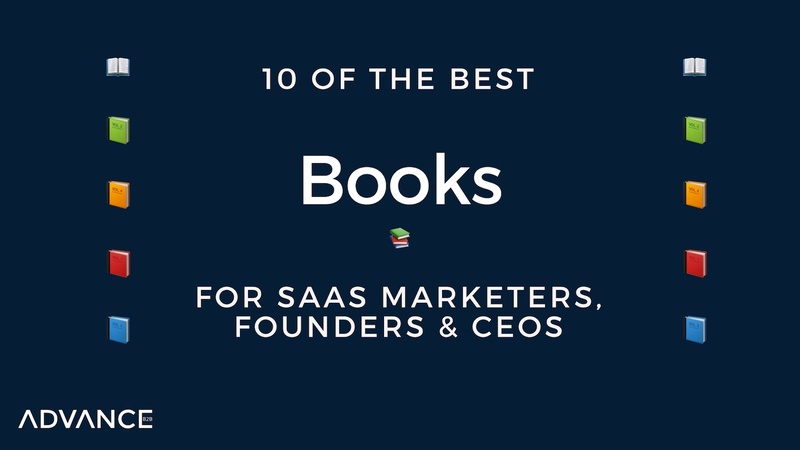 Reading is one of the most powerful ways to accelerate your growth and development, so we reached out to the Advance Insider community to uncover some of the best books SaaS marketers, founders & CEOs should read. Take a look and let us know what your recommendation is in the comments! Why: "Whether you're doing consumer or B2B marketing, this book asks powerful questions in the form of invariable truths that will help you hone in on what kind of brand you're trying to build and why it might not be working the way you want. This book makes bets, and as it was published in 1993, we know how some of those bets played out - I particularly enjoyed the segment about Donald Trump, but there's also great snippets about IBM, Apple, and other iconic brands." Why: "Mark describes the shift from “inside-out sales” (where we the sellers decide when to contact a prospect) to “outside-in sales” (where the customer decides when they want to be contacted) so clearly, with a lovely “engineering” kind of way, that you just get it. I recommend the book to every sales director and marketing director, but ONLY if they want to grow." Why: "A lot of us younger folks never got experience with managing and this book is a great little MBA on how to manage people and run your team properly." Why: "It was recommended by one of our investors at Notion Capital and it's all about category design and is definitely one of the best business books I have ever read." Why: "It has everything you need to know about how to break through creative barriers." Why: "This book changed my opinion on buyer personas. The typical buyer persona I had seen before this book was too vague, with information that wasn't relevant to growth marketing. What I found here was something structured that laid a path to more relevant and useful tools." Why: "It's not a business book but it's all about helping you be more creative." Why: "It's a great look into the psychology of why people make certain buying decisions and how we all think and behave. It's a classic since it was written in the 80s, and those are the ones I try to stick towards since those lessons don't change." Why: "There are some great books like The Challenger Sales, Predictable Revenue and The Sales Acceleration Formula, but if i had to pick one then it's Ogilvy on Advertising as it's a timeless classic." Why: "Phil Knight is the founder of Nike and this book tells the story of everything you didn't know about how a little Oregon-based company called Blue Ribbon Sports became the world's most valuable sports brand. It's wonderfully written and reinforces the importance of hard work, passion and sacrifice as the foundations for success. If you're a sports fan then you'll love it even more."